Any quantity only $5.29 per oz over spot! Used by hunters and military forces around the globe, the .308 caliber from Winchester is among the most used in the world. Popular among hunters for accuracy and ability to take down medium- to large-sized game, the .308 bullet is also a common design in silver bullets available for silver buyers. 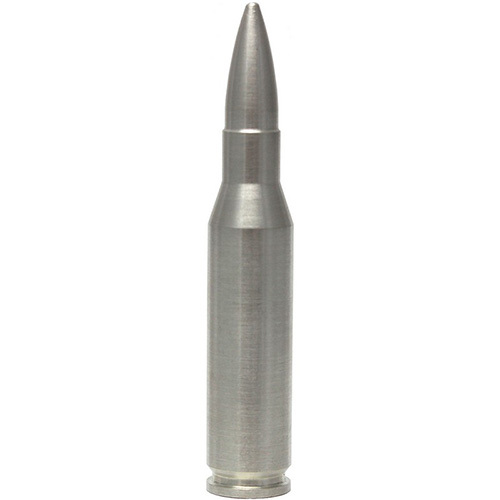 The 2 oz Silver Bullet .308 Caliber is currently available to you for online purchase at Silver.com. Product ships to you with protective packaging including 10 silver bullets! Silver bullet accurately reflects the look of .308 caliber rounds! A truly distinct addition to any silver collection or portfolio. Buying silver bullets represents a unique addition to any silver collection or portfolio. When compared to silver coins or silver bullion bars, silver bullets have lower premiums over the spot price of silver while still containing the same .999 pure silver content of many of those products. Additionally, as a collectible piece, silver bullets are a great conversation starter. You could always tell your friends you hunt werewolves in your free time! 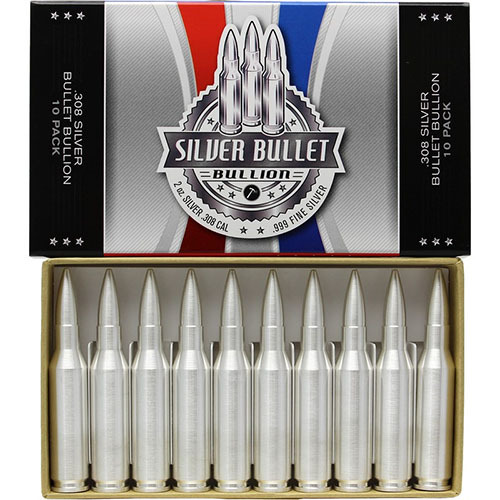 These 2 oz Silver Bullet .308 Caliber products mimic the look of a .308 round from Winchester, one of the most popular in the world. Though these rounds are not designed for live-fire use, you’ll be surprised how close their design and appearance is to that of actual rounds. There’s no greater way to diversify your silver than with silver bullets. Today, Winchester is a brand name used by two subsidiaries of the Olin Corporation. The Herstal Group of Belgium uses the brand, as does the Browning Arms Company of Ogden, Utah in the United States. Winchester was once a standalone brand that developed pistols, rifles, shotguns, and ammunition. The .308 caliber round was developed in 1952. Winchester released the first .308 caliber rounds for hunting rifles, a format that remains popular today among hunters of whitetail deer and pronghorn. Winchester’s .308 caliber round is also the presentation cartridge for NATO’s 7.62×51 round. All 2 oz Silver Bullet .308 Caliber products available to you at Silver.com come in a form reflecting the size and shape of the round. The design of the silver product itself offers the visual appeal to these products, with no additional design elements engraved on to the silver bullets. You will find the weight, purity, and metal content engraved on the bottom of the round near the design of the primer. We encourage Silver.com customers to reach out to us with questions at 888-989-7223. You can also connect with us online through our live chat and email address.